Residents at a Shropshire care home are set to benefit from a generous donation from a firm of county solicitors. Fodens Solicitors, which has recently opened a new Head Office at Junction 6 of the M54 in Telford, has handed over £15,000 to the Comfort Fund at Coverage Care’s newest home, Montgomery House in Shrewsbury, after choosing to support a local organisation during 2018. Residents and staff will decide how to invest the money in additional facilities and activities at the home. Ideas so far include a wheelchair accessible greenhouse and gardening aides and equipment to get green-fingered residents involved in gardening. Coverage Care Services is Shropshire’s leading independent care home provider and is run on a not-for-profit basis. It runs 14 homes in the county including Montgomery House in Sundorne Road, which opened in November 2016. The purpose built 90-bed home has four units offering residential, nursing and dementia care. Coverage Care Chief Executive David Coull said: “We are very grateful to Fodens for choosing to support Montgomery House with this very generous donation. “We are keen to offer a home from home environment for our residents and this money will be wisely used to offer opportunities for them to enjoy some of the day to day activities they would at home and might be missing while in care. Stephen Foden, from Fodens, said: “We are extremely keen to be supporting such a strong local care network, which provides so much towards our community. 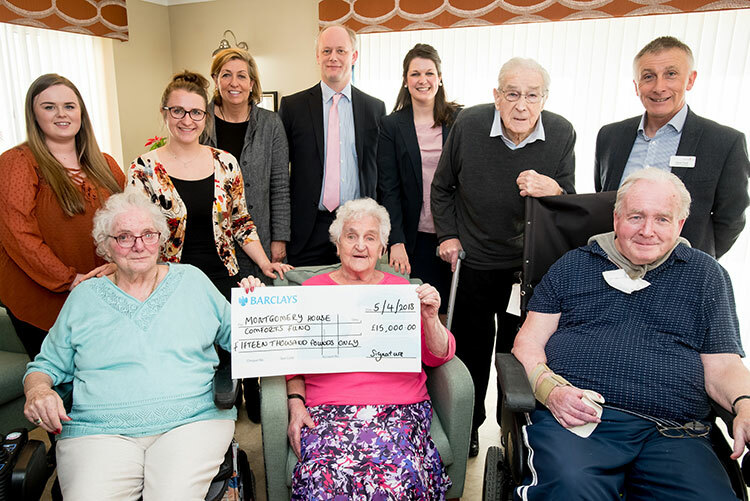 Staff from Fodens Solicitors including Stephen Foden (standing, centre), residents from Montgomery House, and Chief Executive of Coverage Care David Coull (standing, far right) at the cheque handover. This entry was posted in Company News and tagged care homes shropshire, coverage care homes. Bookmark the permalink.